Ottima posizione città a metà per questo primo piano, 3 letto / 2 bagni condominio. Vicino alla spiaggia, Centro congressi, ristoranti e vita notturna, è anche vicino ad altre vacanze che abbiamo in quella zona di strada. Il condominio ha una cucina completa, lavatrice / asciugatrice, lavastoviglie, forno a microonde, 4 TV, VCR / DVD, WiFi, A / C, e parcheggio per 2 auto. Il condominio è non fumatori e animali non sono ammessi. L'occupazione è 8. One of the nicer places we have stayed at in OCMD. Smaller building and much less hassle with parking and elevators etc. 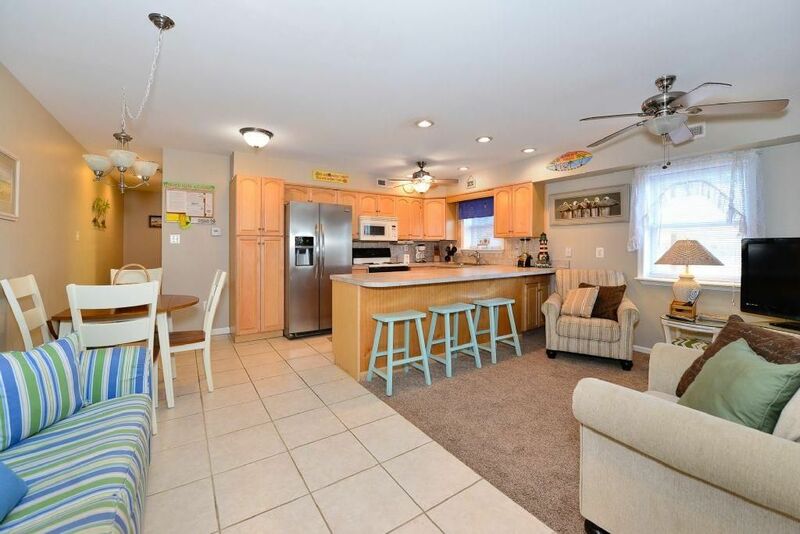 Nicely decorated and just a few steps to the beach. We came in the early season and had a wonderful time. We already booked for a week this summer. Stayed here August 2015 for a week with family. Nice place. Very clean and comfortable. Owner drove 4 hours to repair an AC problem that could have been repaired the next day. Went above and beyond our expectations. We will be back. Thank you for a wonderful vacation. Thank you so much for taking time to review our property. We appreciate and value all feedback. The owners have spent a lot of time remodeling this condo, and take great pride in keeping it in perfect shape, all summer long. We would love to see you come back in 2016! If you do, ask about our free rewards vouchers available to Resort Rental guests. This was the perfect place for my family! With 3 small children, the convenience to the beach was the best. Just a 1 1/2 block walk made it easy to go back and forth for naptimes and all toddler needs. It had just been remodeled prior to our stay and the upgrades and décor were beautiful. Will definitely stay here again! Tariffe soggette a modifiche. Si prega di contattare responsabile della proprietà fino ad oggi le tariffe per tutte le proprietà.